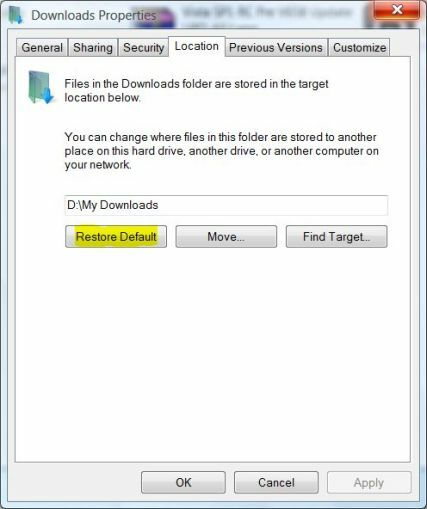 If you have change the default location of user folders (shell folders) such as My Documents folder (and Pictures, Music, Videos, Contacts and other folders in Windows) to another different path, folder location or drive, here’s the way to revert and restore the target location of the folder back to its original default location. Right click on the user shell folder that you want to revert back to original default folder location in the Start Menu or Windows Explorer or desktop icon, and then click Properties. Click on Target tab (in Windows XP, 2000, Me, 98 or earlier) or Location tab (in Windows Vista, 7, 8, 8.1, 10 or later). In the Move Documents box, click Yes to move your documents to the new location (default folder in “Documents and Settings” (Windows XP) or “Users” (Windows Vista or later)), or click No to leave your documents in the original location.